BBC coverage: across BBC TV, radio and online starts on 29 June with 153 hours of tennis scheduled and up to 15 live streams available. Read more: BBC coverage bigger than ever and TV and radio schedules. Serena Williams warmed up for Wimbledon on Jack Nicklaus' grass courts, and watched on TV as the American golfer Jordan Spieth won the US Open to complete the first half of the Grand Slam. Williams has already done the same, and will be three-quarters of the way there if she wins Wimbledon for a sixth time on 11 July. The runaway world number one would also complete another 'Serena Slam,' by holding all four Grand Slam titles at the same time for the second time in her career. But the true Grand Slam demands victory in Melbourne, Paris, London and New York in the same calendar year, and is an achievement which the 33-year-old is not discounting. 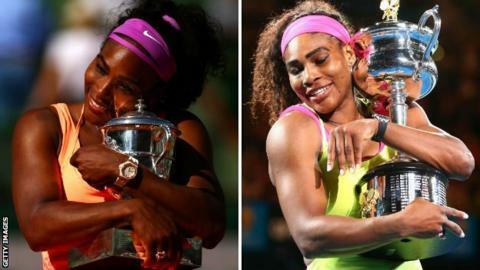 "There's a part of me that believes I can still do it, but it's definitely not easy to do," Williams told BBC Sport on the eve of the Championships. "We're in Grand Slam season: we have so many Grand Slams coming up. We've just finished the French - the US Open is coming soon - and they're kind of back to back to back, and it's not easy to do." It would be a phenomenal achievement - especially when you consider she won her first Grand Slam in the last century - although not nearly as unlikely as Jordan Spieth winning all four major golf championships in the same year. His challenge is even greater, as there are more potential winners in a 'major' field and you are not directly able to influence all your opponents in the way a tennis player can. "I am getting into golf slowly," Williams said. "I watched Spieth win, and it was cool, because he's won two in a row so I'm like cool, now I have someone with me." Jack Nicklaus also won the Masters and the US Open in the first half of 1972, but it is the three grass courts at his home in Florida that may prove more significant to Williams's story. Serena would only say that they were some of the best grass courts she has ever hit on - "outside of Wimbledon, of course" - but it would be fascinating to eavesdrop on any conversations between the man with 18 majors and the woman with 20 Grand Slams. Williams claimed at last year's Australian Open that the calendar Grand Slam was something she had given up on many years previously. Her defeat by Ana Ivanovic in Melbourne was followed by an early exit to Garbine Muguruza at Roland Garros, and to Alize Cornet at Wimbledon. But she then equalled Martina Navratilova and Chris Evert's haul of 18 Grand Slam titles at the US Open, before winning the first two Slams of 2015. Further success at Wimbledon and the US Open would equal Steffi Graf's tally of 22 Grand Slams and emulate the German star's 1988 achievement of winning all four in the same year. "Unfortunately I haven't done really well here in the past couple of years - although I think it suits my game the best," Williams continued. "So I don't really feel the pressure to get the 'Serena Slam', and I definitely don't feel pressure to get the whole Grand Slam. I want to win Wimbledon and I want to win it probably more than most people would ever want to win it." Novak Djokovic would have been in the same position as Williams if Stan Wawrinka hadn't beaten him in the French Open final three weeks ago. "If Serena manages to do it, she'll just confirm that she is, if not the greatest, then definitely one of the greatest tennis players that ever played the game," Djokovic said, as he prepares to defend his Wimbledon title. "She wins most of her matches because of that mental edge. She knows what she's supposed to do. Most of the players, obviously we are a bit intimidated by her, and all the success that she had." Williams says that as the youngest of five children, she has always had to scrap and fight. And that natural instinct has not deserted her as she has evolved into the tour's most senior figure. The outcome at Wimbledon is by no means a foregone conclusion. Williams often looks vulnerable in the early rounds and a player like Petra Kvitova can look unstoppable on grass when in full health and on top form. But nearly sixteen years after her first Grand Slam triumph, Williams remains the woman to beat. And if no-one can, then the ball is in Jordan Spieth's court. Or more accurately, on the Old Course at St Andrews, where in the middle of July the 21-year-old will be trying to complete the third leg of golf's Grand Slam.